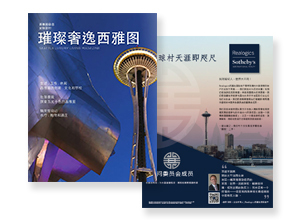 Executives of Realogics Sotheby’s International Realty and Tiger Oak Publication’s Seattle Magazine have just released a 92-page, all-Mandarin magazine called “Seattle Luxury Living” in response to a steady rise in affluent Chinese nationals arriving to the Seattle/Bellevue metro area. The publication will be distributed locally and overseas at select retail stores and hotels, within private and first class lounges at airports and by affiliates of Sotheby’s International Realty. The magazine will also be showcased at select Starbucks stores locally and in Shanghai and across numerous digital media platforms in China including a custom WeChat app built by AdSage.